1. Place the cheese, potato, black pudding, mustard, shallot and flour in a bowl and mix to combine well. 2. With flour-dusted hands, mould the mixture into 12 x 5cm croquettes. Dust with flour, then dip in the beaten egg, followed by the breadcrumbs to coat completely. 3. Heat the oil in a frying pan over a medium heat. Shallow-fry the croquettes in 2 batches, turning occasionally, for 3-4 minutes until crisp and golden brown all over. Remove from the pan and drain on kitchen paper. 4. 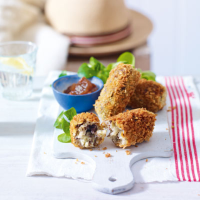 Place the croquettes on a plate, garnish with pea shoots or lamb’s lettuce and serve with a chutney of your choice, such as Waitrose Rhubarb, Apple & Ginger Chutney. This recipe was first published in Mon May 12 13:49:00 BST 2014.